High-end tablets and phones may be atop many other gift options for people, especially with the release of Apple iPad Air/2 and Kindle Fire HDX 8.9 of Amazon. Two amazing tablets hit the market nearly at the same time. No wonder that people can't make up their mind about choosing Kindle Fire HDX 8.9 or iPad Air. Of course, both Kindle Fire HDX 8.9 and iPad Air are great tablets with ultra multimedia experience and high quality display, while there are still differences between them. In some ways, the iPad Air may be better (iPad Air 2 has been available), but some people, on the contrary, think that Amazon tablet Kindle Fire HDX 8.9 is far better than iPad Air. 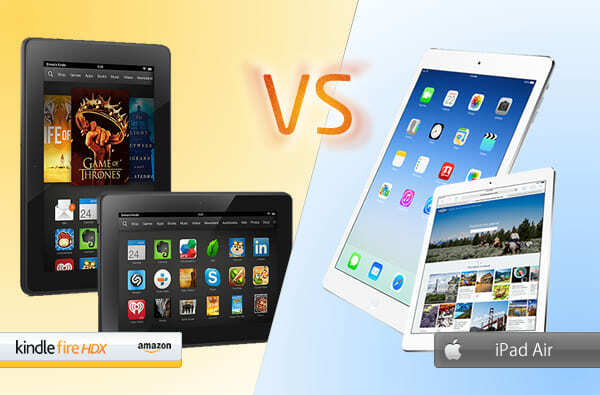 So comparing iPad Air with Kindle Fire HDX 8.9, which is the best tablet? Will the differences between them make iPad Air outshine the kindle Fire or kindle Fire HDX 8.9 outdo iPad Air? Let's take a look of our elaborate comparison of iPad Air vs. Kindle Fire HDX 8.9 from several respects. >> Check out iPad Air 2 Supported Video Formats | Best Video Formats for Amazon Kindle Fire HD/HDX . To be clear at a glance of configurations of Apple iPad Air and Kindle Fire HDX 8.9 Amazon tablet, a specification table (iPad Air vs. Kindle Fire HDX 8.9) is listed for you as follows. The numbers will speak for themselves and you will get an overview of important parameters. Next we will get into specifics. * There are two models of Kindle Fire HDX (8.9/7), and we just focus on Kindle Fire HDX 8.9 vs. iPad Air. Except for specifications of iPad Air vs. Kindle Fire HDX 8.9, we are now into the session of presenting detailed analysis of Kindle Fire HDX 8.9 vs. iPad Air. Apple's new iPad Air and Amazon's latest tablet, iPad Air/2 vs. Kindle Fire HDX 8.9, which will be the winner and which tablets will you opt for? 1. Compared with the HDX's plastic chassis, iPad Air and iPad Air 2 has a more elegant aluminum back. 2. With a larger 9.7-inch display than Kindle Fire HDX 8.9, iPad Air/2 gives you more screen in a thinner package for better enjoyment of video. And actually its weight and size has been reduced compared with its predecessor iPad 4. 3. iOS 7 brings iPad Air a brighter and more intuitive interface design, an improved notifications window, a quick-settings Control Center menu and an improved feature of multitasking, while iPad Air 2 comes with the newest iOS 8. 4. The biggest advantage the iPad Air has is the App Store's huge selection of apps specifically designed for tablets. While Amazon offers 75,000 free apps, Apple App store has more than 475,000 tablet-friendly apps for iPad Air (2). And we have no idea whether or how many Amazon apps are tablet-optimized. 1. Amazon tablet Kindle Fire is a must-have tablet for Amazon Prime members, which is both strength and limit for Kindle. You can enjoy tons of free media contents by being an Amazon member with $79.99 per year. However, you can get the same contents on the iPad Air 2. 2. The Kindle Fire HDX 8.9 wins on price. For $120-220 less, Amazon's slate Kindle Fire HDX 8.9 still comes to you with a high-resolution screen (339 PPI), even sharper than the iPad Air Retina display (264 PPI) according to the data. 3. Kindle Fire HDX 8.9 is a great tablet, especially for families for the parental controls. Parents can set specific categories of accessible content for kids to keep them away from inappropriate apps and web pages, such as games and some movies. 4. Compared with iPad Air, Kindle Fire HDX is lighter and great to hold especially when watching video. That may be, of course, a result of its smaller screen design. 5. Another amazing design of Kindle Fire HDX 8.9 is the Mayday button, for those who want instant tech support. With different selling points listed above of Kindle Fire HDX 8.9 vs. iPad Air, you may already find out the answer of which one is better or or more appropriate for you. Actually, which tablet is of higher value varies from people to people, depending on their specific needs. So take into consideration of the final tablet user and factors mattering to him, and the decision would be easier to make. No matter which tablet you choose, iPad Air/2 or Kindle Fire HDX 8.9, you will need a HD video converter for enjoy videos of high-definition on your high-end tablet. iPad Air 2 is only compatible with MP4, MOV, M4V, and Kindle Fire only supports MP4 and VP8, while there are hundreds of other video formats like MKV, H.265, MTS, FLV, you cannot play on the two tablets. What a pity! That's the reason why video converter comes to you. 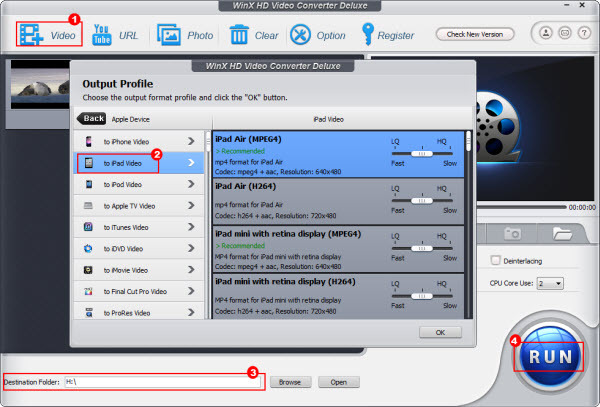 There are many free video converters, like Handbrake, WinX Video Converter and the like. However, the output file may not well fit your iPad Air 2 and Kindle Fire HDX 8.9. So to get yourself a really qualified iPad Air/Kindle Fire HDX video converter, WinX HD Video Converter Deluxe may be a good option for you, which can convert MKV, AVCHD, AVI, MP4, WMV, MOV, FLV to Kindle Fire HDX 8.9 with fast speed, make you play HD MKV videos on Apple iPad Air and offer you 410+ presets for any other popular Apple Android, Microsoft, Sony phones and tablets. The ultimate online video downloader and converter software capable of downloading SD/HD/4K/8K/3D movies from YouTub/Facebook/Dailymotion/Viemo and alike sites (up to 300) and converting to mainstream video formats, AVI, MP4, MPEG, WMV, MOV, FLV, and fashionable devices like iPhone, iPad, iPod, Apple TV, Android, Microsoft, WP8, Surface Xbox, Samsung Galaxy Tab, HTC, PSP, PS4, as well as general phones/tablets with hi-fi images/audios reaching 83x real-time conversion speed.